Tee Ball Interactive – Are you ready to step up to the plate and compete in the major leagues? Well, even if you don't have all it takes, you may have a pretty monster swing, which means that come your birthday party, special event, or corporate gathering, you can display your physical feet by stepping up to some good old-fashioned batting practice with the About to Bounce Tee Ball Interactive. Here's how to play: Tee-up and head plastic baseballs into the outfield. If you have incredible aim, the back wall has well-placed holes, with 10 point scores for each hit. Complete with beautiful artwork, the Tee Ball Interactive has everything you need to make your guests want to yell, "batter up!" 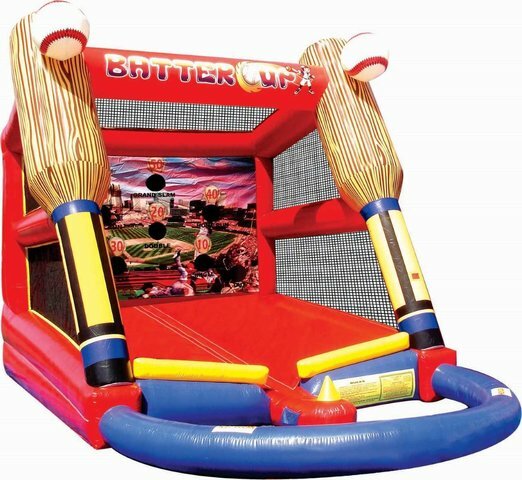 Priced at $179.95 for a five hour rental, the About to Bounce Tee Ball Interactive is one fantastic piece of entertainment that will knock the excitement of your party out of the park.